Welcome to Spring in Melbourne! The week started with unseasonable warm northerly winds and plenty of sunshine - shorts weather even - and has already turned to thunderstorms, hail, and rain, and the heater has resumed it's function. Alas, knitting out on the veranda, in the guise of absorbing a daily dose of Vitamin D,was short lived and time spent behind the sewing machine has recommenced. Peacock Lane by Violet Craft is the fabric focus of this quilt top. Just how adorable are those elephants? Peacock Lane is a wonderful vibrant fabric range and the colors and designs all work together perfectly. I have also added a varied selection of neutral and graphic prints from stash, including linen and hand screen printed favorites. I really enjoy this kind of fabric play - although I always end up with piles of fabric on every corner of the table, and every available chair. Messy business it is ... I need someone to come tidy my fabric stash! Picture overload today! It seems those threatening storm clouds provided the perfect light conditions. The elephants are ab fab! All of that fabric is really beautiful! 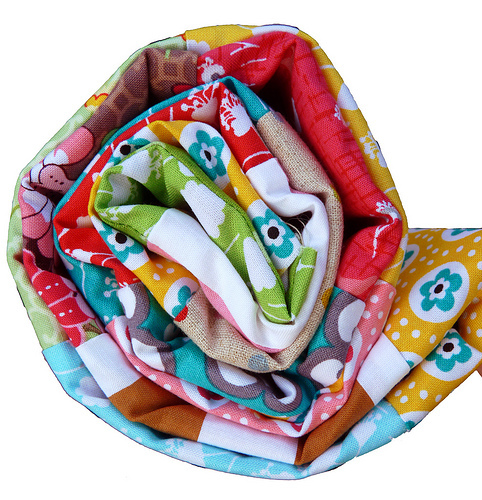 I've been trying to resist the temptation of these new fabrics --- aaaach! Beautiful! Well we are moving nicely into fall!!! Leaves turning and evening fires lit!!! 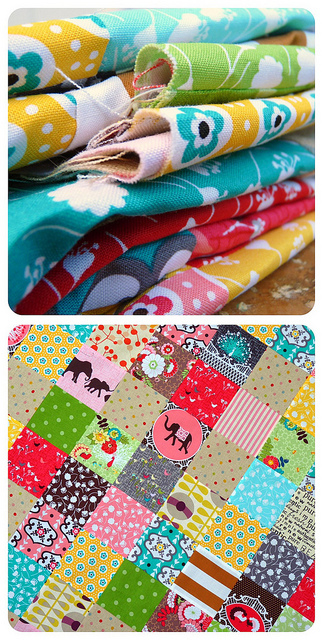 I love your elephant quilt...it is going to be a stunner! I love this so much!!! The colors are great! Oh my...those elephants are fantastic! You did a great job! Did you use the accuquilt machine for all those little squares? So effective. I love those fussy cut elephants, so cute! You're right! The elephants are lovely, and so are those peacocks! lOVE IT !!! It's a make you happy , even when it's gloomy out !! If only I lived about 1000km closer! I'd love to see and sort your stash! 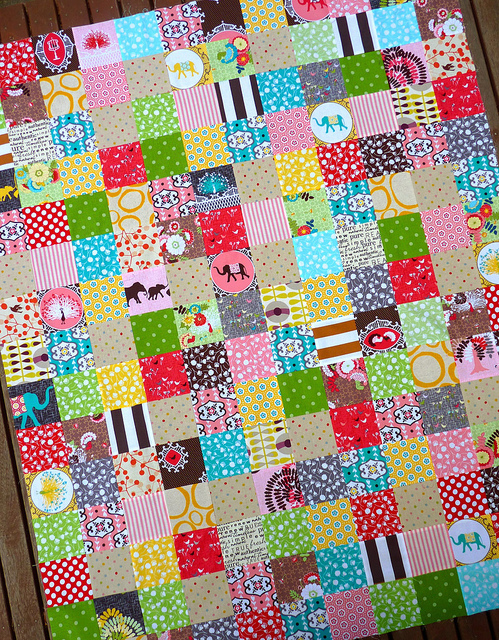 I`m agree,the elephant are adorable.You quilt stunning.Well done!! I love the vibrant colors of that quilt top! And the elephants are so cute! yes i will "tidy" the stash lol. this one is going to be a beauty!. as usual. Oh how I disliked the beginning of that post, all I felt was "No, not now again!". Here autumn has arrived and we're just starting to get the temperature down while we're eagerly waiting for the COLD northern winds to really get grasp. Our summer was just way too hot and the whole family is so relieved the cold and the darkness have started to arrive. I have a lot of family living down under and loving it, and I think it's such a great and interesting part of the world, but I think my heart really belongs here up north (northern Sweden), I just couldn't take the heat! I'll pop over and tidy your stash-maybe you won't miss a few scraps! ;-)) crazy Melbourne weather!! I too make a big mess when creating. Whomever you find to clean up your piles can come to my house when they're done! Never too many pictures! Enjoy your spring weather! You don't really want someone to tidy for you - you'll never find anything! We all have our own unique "filing" systems! The weather here in Sydney continues to be beautiful - less windy than yesterday and only a brief shower last night. I could go outside and knit but after more than two weeks away from my machine with sinusitis, I'm going to attempt to sew! What a fun, happy quilt Rita. We are getting ready for a Melbourne visit next week, I suppose I should pack for all seasons!!! 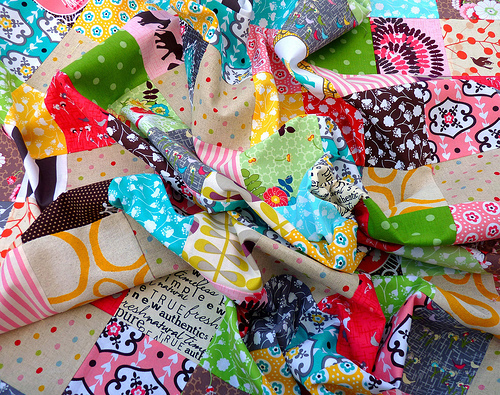 I love this and I really need to go and buy a bundle of these fabrics!! First day of fall here (Nova Scotia, Canada) and not much of a warm summer. Therefore, I volunteer as well. Looks like you might have a house full of active cleaners. Seems like a small price to pay for nice weather, a dream country to visit, cheery quilts and I am sure wonderful company. Your quilts always make me feel happy and oh! the fussy cut elephants. What a fun quilt! Love the elephants and the colors! Well done, Great work!